Or view larger version. Despair. July 10, 1906. Edwin Deakin. Oil paint on canvas. Collection of Oakland Museum of California. Gift of Mr. and Mrs. Howard Willoughby. 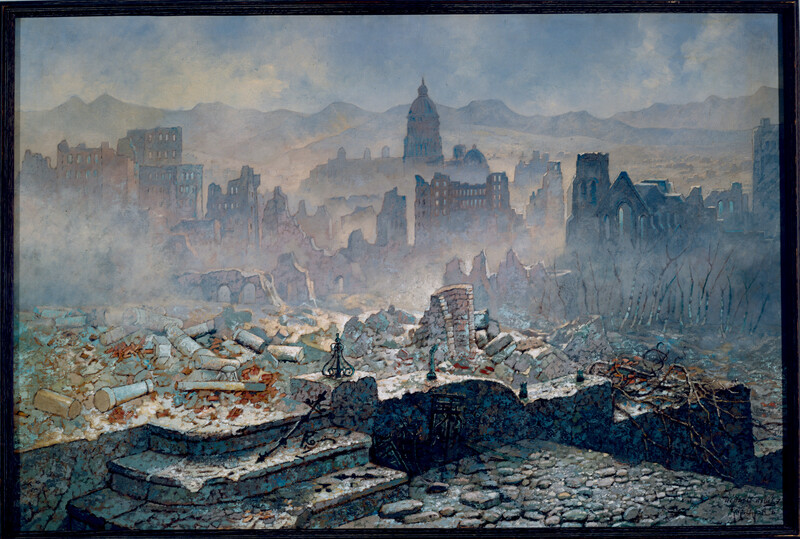 This painting depicts the city of San Francisco in ruins after the 1906 earthquake and fire. The city of San Francisco was hit with a 7.7 magnitude earthquake at 5:12 AM on the morning of April 18, 1906. The earthquake caused a series of fires that burned for three days, destroying more than 28,000 structures and leveling more than three-quarters of the city, including some 80% of housing.